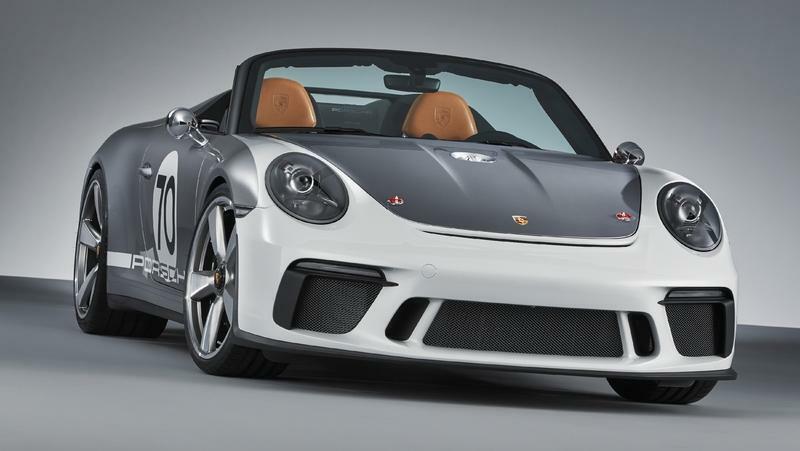 The Speedster is the third 911-based convertible and the rarest drop-top in the lineup. Essentially a mash-up between the regular Cabriolet and the Targa, it has low-cut windshield and side windows and two flying buttresses on the rear deck lid. 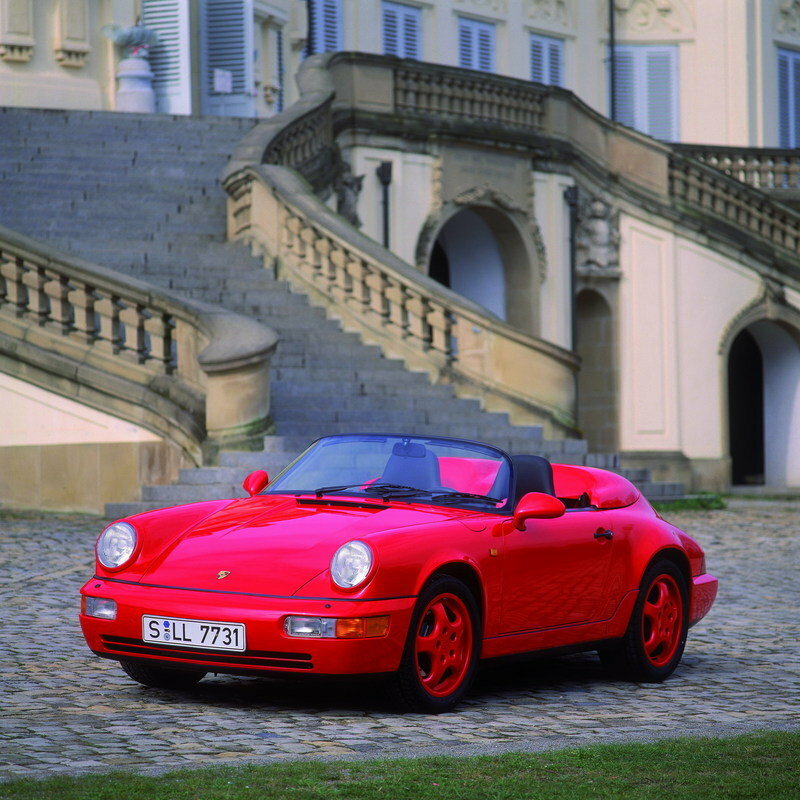 It also features a manually operated soft-top for weight-saving purposes, but also because Porsche conceived this convertible as a purist car. Just like the 911 GT3, it features a number of lightweight components. 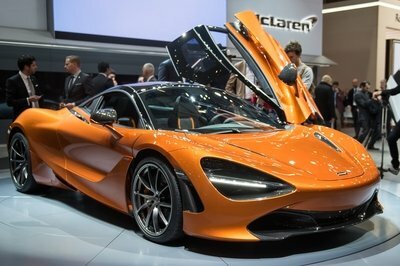 The flying buttresses are made from carbon-fiber, while the front luggage compartment lid, the front fenders, and rear deck lid are made from carbon-fiber composite material, Both the front and rear fascias are made from polyurethane. The Speedster rides on 20-inch center-lock wheels, which are borrowed from the 911 GT3, that are wrapped in Ultra High Performance tires for enhanced grip. 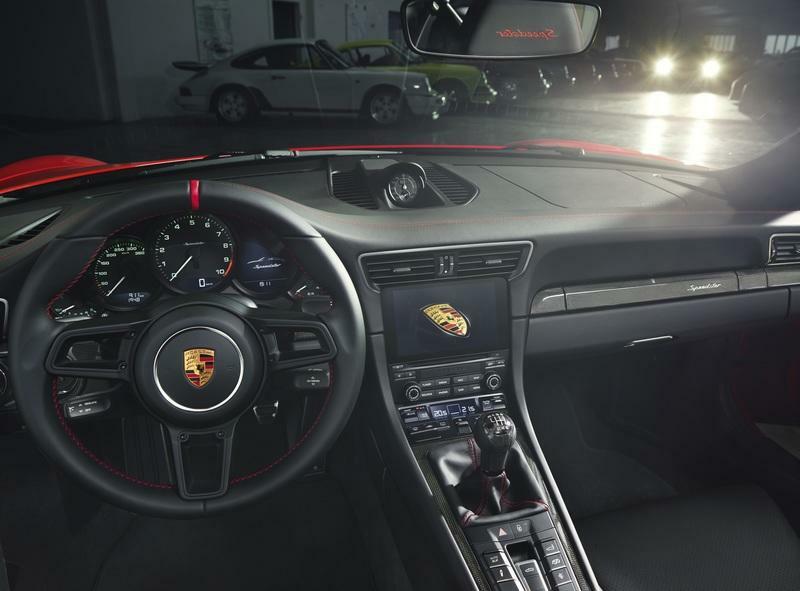 The Speedster’s interior is also based on the 911 GT3, so it benefits from many of its race-inspired features. The regular door panels were replaced with lightweight units that feature storage nets and fabric door pulls. These are black as standard, but you can order them in red for a striking contrast. If you’re a fan of carbon fiber, the Speedster has plenty on the dashboard and the center console frame. Black leather is standard in the Speedster, while red stitching on the seats, steering wheel, ad gear shifter is optional. You can also opt for a red marker on the steering wheel, yet another race-inspired feature. The "Speedster" lettering on the headrests helps the interior stand out even more. The 911’s air conditioning system is removed from the Speedster as standard, in order to save weight, but Porsche will be happy to put it back as a no-cost option. The Speedster shares many oily bits, including the engine, with the 911 GT3 and GT3 RS. The engine is the same 4.0-liter flat-six unit, but it features custom individual throttle bodies. The unit is rated at 502 horsepower and 346 pound-feet of torque, a mild two-horsepower and seven-pound-foot increase over the GT3. On the other hand, the Speedster slots below the GT3 RS output-wise, as the range-topping naturally aspirated model comes with 520 horsepower on tap. 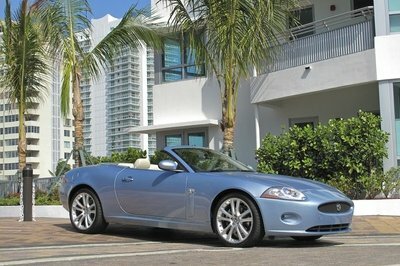 The Speedster is available with a six-speed manual transmission only. 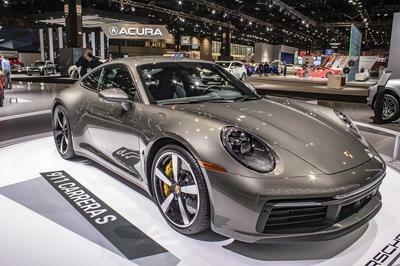 That’s because Porsche wants to keep it purist-oriented, but it’s also because the six-speed manual saves almost 40 pounds compared to the PDK automatic. The sprint to 60 mph takes 3.8 seconds, identical to the manual 911 GT3, but six tenths slower than the PDK version. The Speedster’s top speed is limited to 192 mph, a six mph decrease from the GT3. This is a normal downgrade for a vehicle that doesn’t have a proper top. Finally, Porsche’s Ceramic Composite Brakes (PCCB) package comes standard. These brakes not only save a lot of weight, but also improve stopping power and performance on the track. Porsche created a unique chronograph for the 911 Speedster. Developed in-house, the Flyback-Chronograph watch with Werk 01.200 movement features specific elements inspired by the Speedster. It has a carbon-fiber dial, a rotor made after the car’s center-lock wheel design, a strap made from the same leather with red stitching used inside the car. The modern Speedster pays tribute to a nameplate that goes all the way back to 1957, before the 911 was designed. 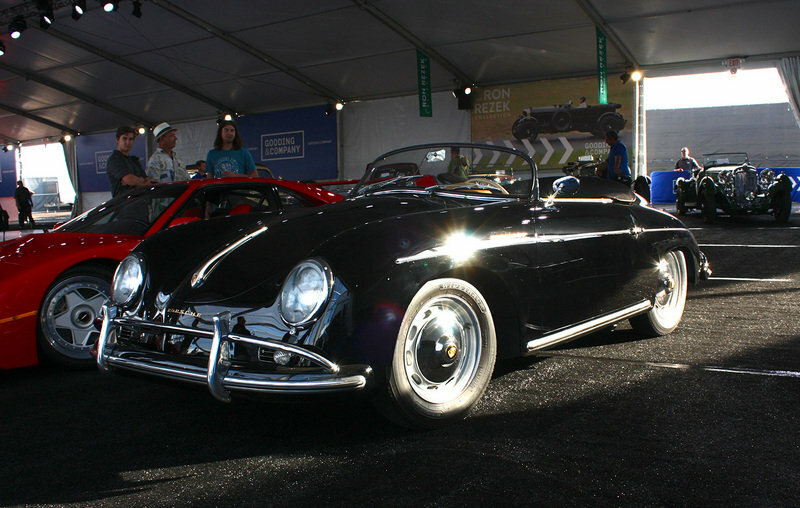 The first Speedster was based on the 356, the 911’s predecessor, and it was called the 356 A 1500 GS Carrera GT Speedster. The first Speedster based on the 911 was introduced in 1988, while the most recent iteration was launched in 2010. Based on the 997-generation 911, the previous Speedster was limited to only 356 units as a tribute to the original car. 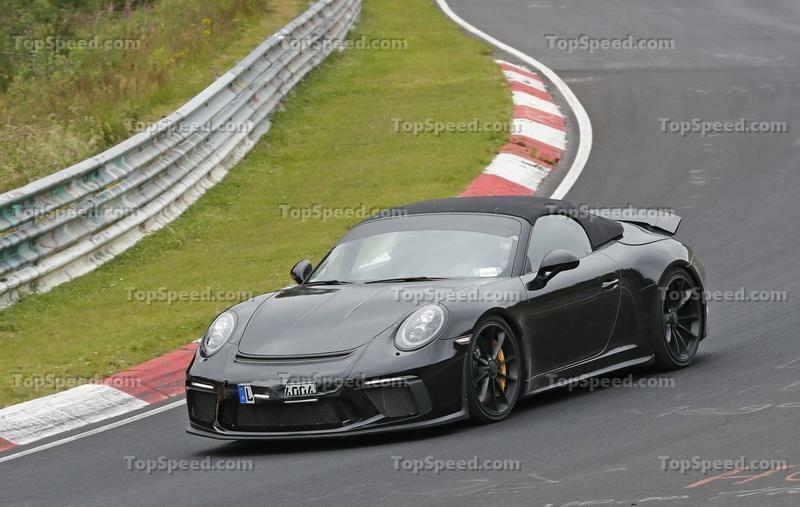 Read our full speculative review on the 2020 Porsche 911 Speedster. 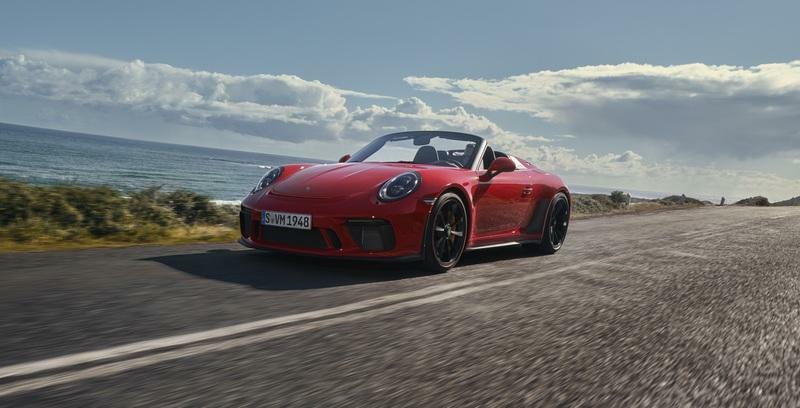 The 2019 911 Speedster is the first such model developed by the Porsche Motorsport department, but it is still immediately recognizable as a Speedster. 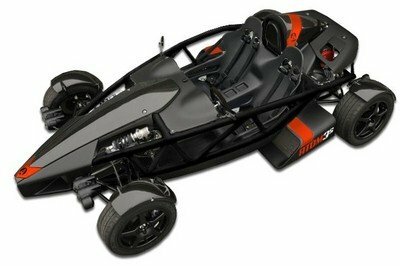 The low-cut front windshield and side windows as well as the manually operated lightweight fabric top are characteristic for a Speedster model and make the car stand out immediately. The two streamliners atop the rear decklid made from carbon fiber are another design highlight rooted in the model’s history. The interior of the 911 Speedster is characterized by a focus on the essentials of driving. Lightweight door panels with storage nets and door pulls emphasize the dedication to weight reduction. The standard black leather interior can be supplemented with red stitching for the dashboard and the “Speedster” designation in the headrests. With this option, the door pulls are also fitted in red, and the GT Sport steering wheel is decorated with a red 12 o’clock center marker. The interior trim, which spreads to the gear shift knob as well as the door sill guards with “Speedster” model designation, is carbon fiber. Underscoring its purist focus, extensive measures of lightweight construction help keep the weight of the new 911 Speedster down. 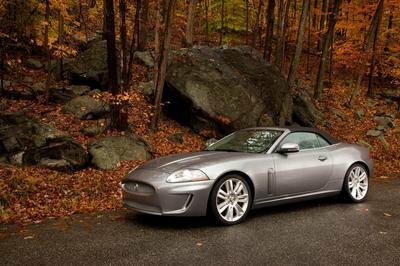 The front luggage compartment lid, front fenders and rear decklid are all made from carbon fiber composite material, while the front and rear fasciae consist of lightweight polyurethane. Standard Porsche Ceramic Composite Brakes (PCCB) save about 50 percent from the system weight with grey cast iron rotors. The fabric top does without any automated operation, save for the electrically-operated latch to lock and unlock it. Air conditioning is omitted as standard in the interest of weight savings, but can be added as a no-cost option if the customer desires. Finally, the six-speed manual transmission saves about 9 pounds compared to the seven-speed manual transmission in other 911 Carrera models, and almost 40 pounds compared to a PDK dual clutch unit. With this clear focus on lightweight construction, the 2019 911 Speedster weighs just 3,230 pounds. 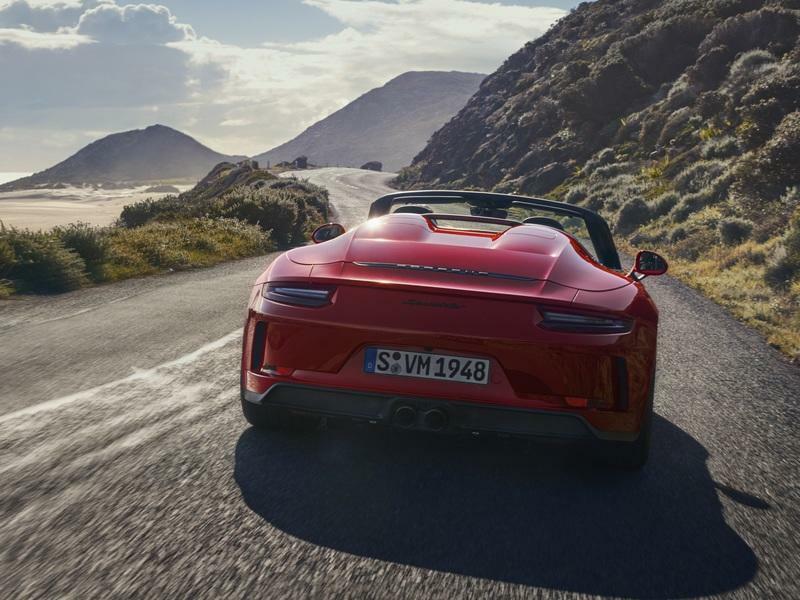 The 2019 911 Speedster uses a chassis derived from the 911 GT3 models with a specifically-calibrated rear axle steering system and dynamic engine mounts to deliver a maximum amount of precision, stability and driving pleasure. 20-inch center lock wheels painted in Satin Black are shod with Ultra High Performance (UHP) tires to offer high levels of grip, while standard PCCB (Porsche Ceramic Composite Brake) delivers very powerful and consistent braking performance. The history of Porsche Speedster models began in the United States.Speedster variants of sports car models, which combine open-top driving pleasure with incredibly distinctive driving dynamics, have been part of the Porsche company history since 1952. The forefather of Porsche Speedster models, the 356 1500 America Roadster, had an aluminum body manufactured entirely by hand. It weighed about 130 pounds (60 kilograms) less than the 356 Coupe and its top track speed of 108 miles per hour (175 km/h) with its 70-hp four-cylinder flat engine was impressive at the time. Featuring slot-in curtain windows for the doors, a folding top and lightweight bucket seats, this car developed exclusively for the US market was built just 16 times and already embodied several key elements of the speedster design. 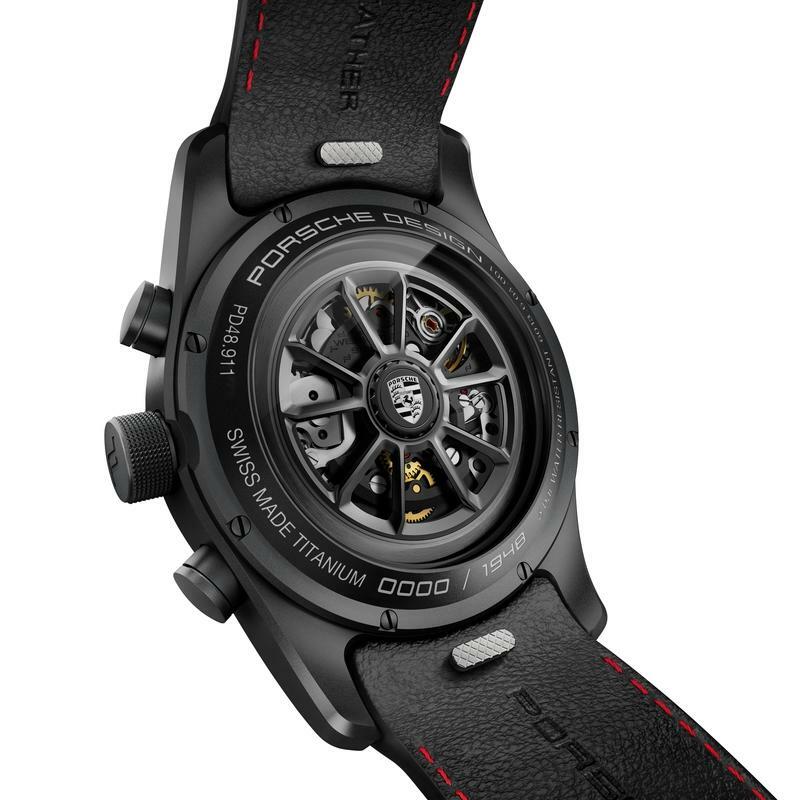 Exclusively for owners, Porsche Design has created a 911 Speedster Chronograph timepiece. The high-performance Flyback-Chronograph with Werk 01.200 movement developed in-house features Speedster specific design elements such as a carbon fiber dial, and a rotor modeled after the Speedster center lock wheel in both design and color. Genuine Porsche interior leather and thread are also used for the perforated black leather strap with red stitching. The company operates a second Porsche Experience Center near Los Angeles. That 53-acre complex features a driver development track with eight educational modules totaling 4.1 miles, a business center, and Restaurant 917. PCNA employs over 300 people who provide parts, service, marketing, and training for 191 dealers. They, in turn, work to provide Porsche customers with a best-in-class experience that is in keeping with the Porsche brand’s 70-year history of leadership in the advancement of vehicle performance, safety, and efficiency. PCNA is an indirect wholly-owned subsidiary of Porsche AG, which is headquartered in Stuttgart, Germany.